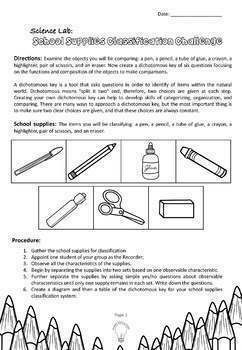 This complimentary source is a bundle of our new favorite activities of introducing a concept of dichotomous key and the process of creating it. A dichotomous key is a tool that asks questions in order to identify the items within the natural world. Dichotomous means "split it two" and, therefore, two choices are given at each step. Creating their own dichotomous key can help your students to develop skills of categorizing, organization, and comparing. There are many ways to approach a dichotomous key, but the most important thing is to make sure two clear choices are given, and that these choices are always constant. 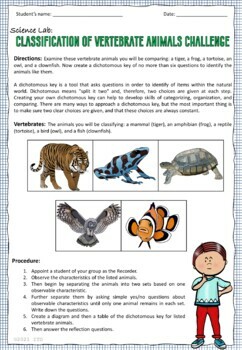 Use these four-page worksheets to introduce students to the concept of scientific classification. Students will be classifying the illustrated objects into nested categories using their own language. This can later be linked to the classification system used by scientists. (Kingdom, Phylum, Class, Order, Family, Genus, and Species). NOTE: While there are samples and possible key answers provided, the created versions of the dichotomous key by students do not have to match them. 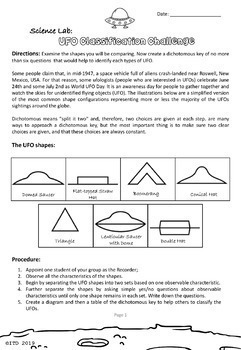 BONUS: This bundle includes a bonus set of worksheets to identify the simplified illustrations of the most common shape configurations representing more or less the majority of the UFOs sightings around the globe: domed saucer, flat-topped straw hat, boomerang, conical hat, double hat, triangle, and lenticular saucer with a dome. You might find it as an enjoyable group activity to celebrate World UFO Day on June 24th or July 2nd. It is a perfect introductory activity before handing out The Dichotomous Key of Friendly Aliens with Guide How to Identify Creatures printables. Thank you in advance for purchasing and/or downloading this file. Enjoy it! Feedback is always appreciated. Make sure you check the PREVIEW out before downloading/ or purchasing the product. If there are some minor changes you would like to be made, please, let me know, and I will do my best to help you out. Dear buyer, I wanted to remind you that you can build up TPT credit for your future purchases by leaving feedback on my products. You can submit feedback right away after the purchase or go to Buy -> My Purchases for a list of what you have bought in the past. Next to each title you`ll find a Provide Feedback button. If you click and leave a rating and comment, you`ll receive the credit. Then go to Account -> TPT Credit Balance to learn about your current TPT Credits and how to redeem them!